There are so many awesome MMA gear out there and that’s why its so hard to choose which are the best because of all the high quality options. With that said, if we had to pick the Top 10 Best MMA gear available today we would choose the following. These evaluations are based on overall criteria of quality craftsmanship, functionality, style and comfort. Sprawl was the original fight short company that introduced high-quality MMA shorts into the market and the Sprawl shorts just keep getting better. The Sprawl Fusion Short has the most advanced system to fit the shorts securely with it’s Channel Lock waistband, but at the same time has 4-way stretch fabric to give you the ultimate in mobility. The Sprawl Fusion has rip-stop fabric and is treated to be sweat and blood repellent, as well as fungus resistant. It’s the perfect fight short available today. RVCA took MMA T shirts to a whole new level. Most people associate MMA T shirts with the “graphic tattoo style” shirt with skulls and all. But RVCA makes shirts that are very sporty and we were amazed when RVCA released the Fedor T shirt for his Strikeforce fight against Brett Rogers. This type of shirt has a simple and refreshing design, that quickly made it one of the most popular MMA T Shirts. The Vitor Belfort shirt also utilizes the same style and comes in Brazilian colors of Green and Yellow. These are the same gloves that the pros and legends wear in the Octagon. These MMA gloves are built tough, with plenty of padding. A long wrap-around wrist strap provides excellent security and adjustability. They are the regulation 4oz. gloves that meet the requirements of all fight organizations. Most fighters train to be in the UFC one day, and it makes absolute sense to train with the UFC’s Official Glove, the best fight glove on the market. We recommend wearing hand wraps with these gloves and make sure to get a size big enough to account for hand wraps. Hayabusa 16.oz sparring glove is perfect for sparring in MMA training. They utilize a super high-quality 100% leather construction and foam padding complex that will absorb high-impact shock for your hand and your sparring partner’s face. But one of the best parts of the Hayabusa Sparring Glove is the Dual Cross closure system, an innovative design that makes the glove very secure and won’t shift or move during your sparring session. Combat sports bag Gloves have extreme durability for constant use on heavy bags. There is a weighted rod in the palm that give you more grip stability to generate maximum power when hitting the heavy bag. The padding these gloves have are superb, they will protect your hands and wrists when hitting pads at full force. One of the best things about the Combat Sports Bag Gloves is that they are very affordable at under 40 bucks. A mouthguard is one of the most important pieces of MMA gear you will need. Even if you are not engaged in full-contact sparring at the time, there’s a high chance of accidental head butts or elbows that can do damage to your teeth. The Brain Pad Mouthguard is an innovative system to protect your teeth and has been said to even cushion your jaw to prevent concussions and getting knocked out. There is also a breathing channel that will increase the flow of air that can help with your cardio. Most importantly, Brain Pad stands by its product with a $12,000 dental warranty, a pledge that the Brainpad was created to give you the ultimate protection in MMA. The Combat Sport Gel Shock Shin Guards combine the best of both worlds: 1) It has superior padding that has a gel lining to give you the most protection in a shinguard and 2) It also has a neoprene support that covers your whole leg, this secures the shin guard when you are in the most intense scrambles and also when you throw your most powerful kicks. The shinguard wont shift or move like those ones with straps. The only drawback is that these are slightly tougher to put on and take off, but this goes to show how extremely secure they are. Jaco is fairly new to the MMA scene but they have created an innovative MMA protective cup system. Typical MMA cups will shift or slide while grappling and rolling. But the Jaco MMA Cup and Shorts doesn’t, it has these advanced elastic straps and a special compression short to hold the cup in securely place where its supposed to be, all the while protecting your most prized possessions! (Hint: your balls) They are so comfortable and have pad inserts for extra protection during heavy sparring, to minimize muscle soreness from leg kicks. 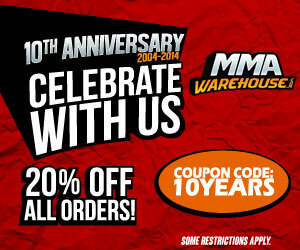 Now that you have all the best gear, you will need the Best MMA gear bag! Datsusara designed the worlds first MMA Gear Bag specifically made for the needs of an MMA Athlete. This bag was inspired by Military gear and actually meets the full US Mil spec standards; meaning it has lasting durability and strength. Most importantly, the Datsusara MMA Gear Bag has specially designed pockets for your different types MMA gear such as your 4oz fight gloves, mouthguard, sparring gloves, towel, water bottle and enough room inside for ALL your other gear (gi, shinguards, headgear, apparel). This bag has it all, even antimicrobial fabric that prevents bacteria growth to reduce odor and keep you from getting sick from bacterial infections.